On October 15, 2011, the Miss Asia Pacific World 2011(MAPW) pageant was held in Busan, South Korea. The pageant was founded and organized by Lawrence Choi of Elite Asia Pacific Company. Choi's critics had claimed that Choi was infringing on the name of a pageant of a similar title - Miss Asia Pacific International - organized by Filipinos which ran from 1968 until 2005. Choi dismissed the claims and proceeded with his pageant which sought to discover new talents among beauty queens and models competing with each other. The original winner, Jung Eun A of Korea, presumably resigned one day after her coronation and was replaced by Florima Treiber of France (I say presumably because other reports say that she was forced to resign by Choi.) Seven months later, Florima was dethroned and was succeeded by Diana Starkova of the Ukraine. Pageant officials claimed that Florima was dethroned for failing to fulfill her contract, but Florima alleges that she was dethroned after questioning the validity of the contract. Last July 2012, Florima wrote to me and asked me to listen to her side of the story. So naturally, the curious investigator in me was enough to accept her proposal. This article features a detailed account of my phone interview with Florima in French and e-mail conversation with her in French and English. To support her allegations of mistreatment by Choi and his staff, Florima sent me a couple of DVDs that feature behind-the-scene video clips from the scandal recorded by Florima and several other contestants. The videos have been posted to YouTube and they follow this article. The videos speak for themselves and clearly manifest the staff's unprofessional, unethical and uncaring treatment of the contestants some of whom took to social media to express their disgust towards Choi and the disorganized - and apparently rigged - pageant. On her official website, Miss Guyana Aletha Shepherd, narrated her unfortunate adventures in Korea from Day 1 and warned potential contestants about Choi and his pageant. It appears that since the scandal happened, Choi has kept a low profile but is still involved with the production area of the pageant. The official website features a new "Leadership Team" headed by CEO Kim Ki-Bae. I have searched all over the Internet to find a photo of Choi, but without success. Even his Facebook page is devoid of any of his image. Does he even exist? LOL. Meanwhile, the Wikipedia entry for Miss Asia Pacific World 2011 does not mention Jung Eun A's name, but mentions the second Korean candidate, Park Sea-bell, who had placed in Top 18. I asked Florima how she had heard about the pageant and she said that Christine Huang, a pageant director and organizer from Taiwan who had accompanied her in Miss International 2010, had suggested that she compete in MAPW. Christine had also told Florima that she and Choi were friends. Florima, convinced by Christine's good graces, consented to Christine's proposal. Strangely, during the three-week duration of the pageant, Florima had never seen or met Choi in person. In fact, no staff member was present at the airport when Florima arrived. After Florima was crowned, she was obligated to remain in Korea for two more weeks. Florima claims that Choi dismissed her inquiry regarding her prize money - which she never received - and the modeling contract that was supposed to be part of the prize package but never materialized. She also said that she, along with her runners-up - Miss Puerto Rico Ingrid Fernandez and Miss Ukraine Diana Starkova - were never compensated for photo shoots that they had done for SidusHQ, the talent and modeling agency in Korea that co-sponsored this "super talent pageant." Florima's other complaints include the fact that she had to design her own sash because the staff did not know how to make one; that none of the clauses in the contract was respected; that she had to take an unpaid leave of absence from work just so she could fly back to Korea to return the crown; that the crown - which was supposedly valued at US$10,000 - cost much less after Florima had it appraised by a jeweler; and that when she googled for more information about Starkova (who replaced her), she discovered that Starkova had appeared in pornographic movies. Overall, Florima said that the pageant has been the worst pageant experience she has ever had and she is trying her best to forget it. When I asked Florima if she had any intention of taking legal action against Choi, she said that she had consulted a lawyer in France who advised her that Korea has its own laws and that she would have to hire a Korean lawyer. However, a friend of Florima's father advised her to be careful because she could be dealing with the Korean Mafia. - One week after the finals, Choi failed to meet with Florima and her two runners-up because he didn't have the money to pay for his own airfare. - Choi had promised that he would pay for the airline tickets of all the contestants and that he would reimburse the national directors for the airfare expenses, but he never did. - No one - not even the media partners - had ever seen Choi in person during the entire duration of the pageant. - Even to this day (almost two years after the 2011 pageant), Choi's "friends" are still waiting to be reimbursed by him for all the financial support that they had loaned to him. They called Choi a "swindler" and that is why he can no longer get any support in Korea. - During their first night in Korea, Misses Taiwan & Malaysia had to stay in a Buddhist temple because Choi had failed to arrange adequate hotel accommodations for the arriving contestants. The girls had to suffer from listening to the nun expounding Buddhist sutras in Korean that they did not understand. - Every time Christine called Choi for an explanation of a problem, he would always blame someone else. - When the girls moved to Daiwu, they were required to perform in a talent competition; however, the organizers awarded the talent winner to a contestant who did not even perform! In fact, she had not even sign up for the competition. They also presented a title called "Best in Africa" to a girl who was not even from Africa. The other contestants protested. Food and refreshments were not provided so the girls had to go to the nearest 7-11 store to buy something to eat and drink. It was right after the talent event in Daiwu that the now infamous "scandal" broke out: Miss Wales Amy Willerton, Miss Costa Rica Pamela Peralta, and Miss Guyana Althea Shepherd left the competition and posted their complaints to YouTube. - As soon as Christine heard about the scandal, she advised her eight girls not to get involved with the scandal until after she arrived to fetch them. Choi then told Christine that the three girls - Wales, Costa Rica and Ghana - had tried to "blackmail him for US$20,000 each, he refused so they went home. - When Christine arrived in Busan to meet with her girls, no one picked her up as she had been promised. When she found out the hotel where her girls were staying, she joined them there but was irritated because Choi had again failed to reserve her a room. So she called up Choi to complain. The girls were also complaining that the chaperones did not speak English, and that they had different chaperones every day. One of the chaperones was a woman named Lacebee who looked "nice, pretty, used to be a model in Seoul," but she liked touching girls and asked to sleep with different girls every night. All of the girls were afraid of Lacebee. - The day before the finals, the girls got together in one room to discuss whether or not they should participate in the finals. Christine's girls stayed in their room and decided not to participate. There were three national directors who convinced Christine to attend, so she did. At that time, Choi was still nowhere to be found. The girls tried to call him many times but he rarely answered; even if he answered, he always had an excuse not to show up. The girls started feeling ill at ease, fearing that they would be kidnapped by the local host. Christine told them that if they feared for their lives, then they should consider packing and not wasting any more time in Korea. - On the day of the finals (Oct. 15), it seemed as if nothing had happened. All the girls went to the finals as scheduled. Christine arrived at the venue - which was open air - but she could not find her seat in the jury panel. So she called Choi again but he didn't answer (he was probably too busy enjoying his bowl of kim chee. lol.) Christine ended up sitting herself in a chair that had been reserved for a jury member who did not show up. In the beginning, the organizers explained to the judges about the scoring system; the judges were given some score sheets and pens, but they were collected even before the judges could select the top 15 semifinalists. In other words, the jury panel only served as a prop to give the impression that the pageant was legitimate and not rigged. Korea had sent two representatives, and Christine was sure that both girls would place in top 15 because "their agency had already paid a big money to the organizer." - When the top 15 semifinalists were announced, lo and behold - the two Korean girls made the cut. When they announced the top 7, Christine and other directors were surprised that Mongolia and Venezuela made the cut since these two countries had not even placed in the semifinals! (It was definitely a WTF moment! lol) Suddenly, it became windy and started to rain, which made the audience flee for shelter. The jury, however, remained at the venue. Then they called Misses Indonesia, India, Russia, France and Korea (Jung Eun A) to the top 5. The Korean co-hosts only spoke Korean and it was hard for the contestants to understand them. No organizer or sponsor came to the stage to crown the winner (Korea). The host placed the small crown on Miss France's head and the big one on Miss Korea's head. - Back at the hotel, the organizers requested the girls to go to a club to meet with sponsors who were waiting for them. But the girls were hungry and tired. When they did go to the club, there was only wine and nothing to eat. So they returned to the bus and they lost all mood to attend the party. Before Christine went to bed, she had reminded her eight girls to take their luggage down before breakfast. Christine had thought that since there were only two narrow elevators, that it would take a lot of time for all the girls to check out at the same time, thus it would be better if all eight of Christine's girls just haul their luggage before breakfast so as not to inconvenience the other girls who would have to wait longer later. - Christine said that she met Sushmita Sen, the former Miss Universe who sent India's representative, Tanvi Singla. Sushmita was part of the VIP and she sat behind Christine. Sushmita had also noticed the discrepancy behind the selection of Mongolia & Venezuela in top 7 even though neither country made the top 15. Christine met Sushmita but she did not have the chance to speak with her as Sushmita did not stay at the same hotel as Christine. In the contract, A could get 70% of the total profit, B & C get 30% (Choi gets 30% from the 30% and girls get 70% from the 30%). - Christine questioned the validity of the contract. Choi told her that he had gotten Florima a big modeling job, that she had already taken photos for a big company, and that effective November 2011 she could haul in US$1,000 a month. Christine then wondered if Miss China had misinterpreted the contract. But before Florima left Seoul, she only received a portion of her flight ticket cost. When she returned to France, she kept asking Choi for her ticket's balance which Choi provided. But that was the only thing she got from him. 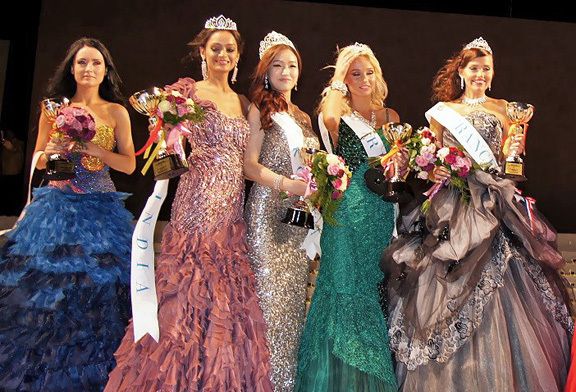 A day after Jung Eun A was dethroned, pageant officials replaced her with Florima Treiber (center), who is flanked by Ingrid Fernandez of Puerto Rico who received a "special" title (which seems to eclipse Florima's title because of the word "star" after it), and by Diana Starkova of the Ukraine wearing an un-ranked runner-up sash. Photo courtesy of Florima's Facebook page. Contestants confront hotel desk clerks who deny them entry back to their rooms to retrieve their luggage. Miss France Florima Treiber speaks in the background. Contestants protest the unfair judging system of the talent competition as well as the total disorganization of the pageant. It was already 2 in the morning and the girls were all tired and cranky. The organizers had given away prizes to anyone, including girls who did not even sign up to compete in the talent portion. Some of the girls spent one year preparing just for the talent segment - only to be dismissed and ignored in favor of some girls who did not even perform. Florima also noticed a creepy man with sunglasses who told her that he knew everything about her life and her family! Some of the girls became emotional and started crying.